We go away on vacation, business trips, and at times, even our daily work routine has us returning home later than we would prefer. 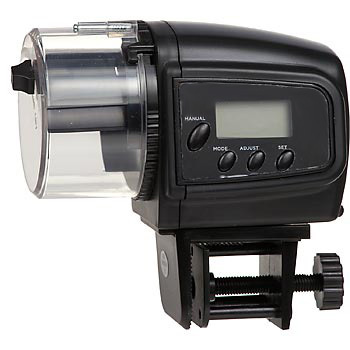 Automatic fish feeders can come in handy in cases such as these, and we have one to give away! Reply in the comments section, either on our website, Facebook, Twitter, or Google+, and tell us how an automatic feeder might come in handy for you to receive 1 entry. Include a photo of your aquarium, and get 2 additional entries. Like this post on Facebook, Twitter, or Google+, and get 3 additional entries. Share this post with your friends, and get an additional 4 entries. But hurry, this contests ends 11:59pm on Saturday, July 5, 2014. The winner will be announced shortly thereafter! Our standard contest rules apply.